Payroll Services Bournemouth for SME business anywhere in Dorset and the surroundings arears, including but not limited to Dorset, Sommerset, Wiltshire, Hampshire, Bournemouth, Weymouth, Dorchester, Blandford, Salisbury and all the towns between. Do you want to be relieve of the time consuming process of administering payroll services Bournemouth, allowing you to get on with what you do best - running your business ? You will not need to rember to send the full payment submission or employers payment summary to HMRC. knowing it will all be done for you with no penalty. 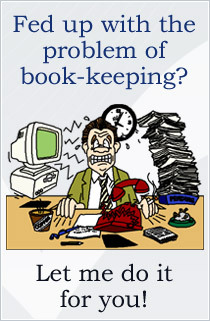 Allum Book-keeping Services can run your payroll services Bournemouth on your behalf. This will include the preparation of pay slips for your employees, informing you of all amounts due to HMRC, operating payroll deductions. At the end of the tax year you will have the appropriate year end return prepare on your behalf. Allum Book-keeping Services comprehensive payroll services Bournemouth will alleviate you of this responsibility and ensure your business complies with the relevant legislation. Businesses are now required to submit their PAYE returns to HMRC on line; this will be done for you. If you do not have a PAYE Scheme setup we can set one up for you. Hold professional indemnity insurance so in the unlike event that I make an mistake you can rest in peace that all work is covered.